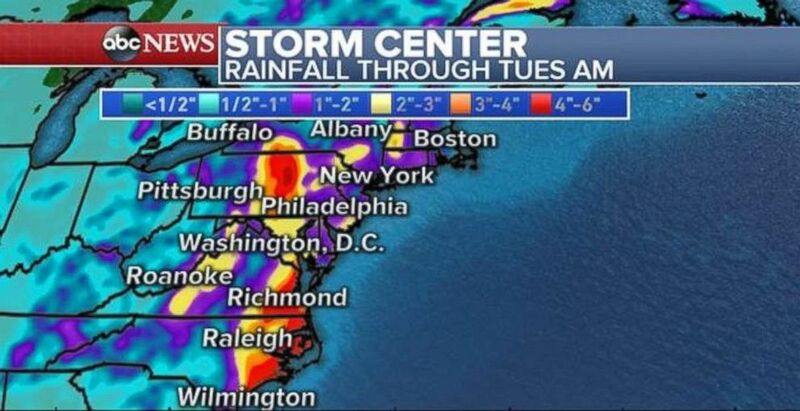 A coastal storm that developed late Saturday brought an onslaught of rain and wind to the mid-Atlantic and Northeast overnight. Unfortunately, the rain shows little sign of slowing down heading into the week. Doppler radar indicated 4 to 7 inches of rain fell in parts of Virginia and Maryland. Flash flooding and road closures have been reported in the Washington, D.C., and Baltimore metro areas. The Jersey shore also received heavy rain, including 4.55 inches of rain in Brick Township as of Saturday night. The final total will likely be higher. Wind gusts over 50 mph have been reported along the shoreline of New Jersey, as well. The winds will become calmer along the shoreline during the morning hours on Sunday. Much of the rain has pushed inland into Pennsylvania and New York. 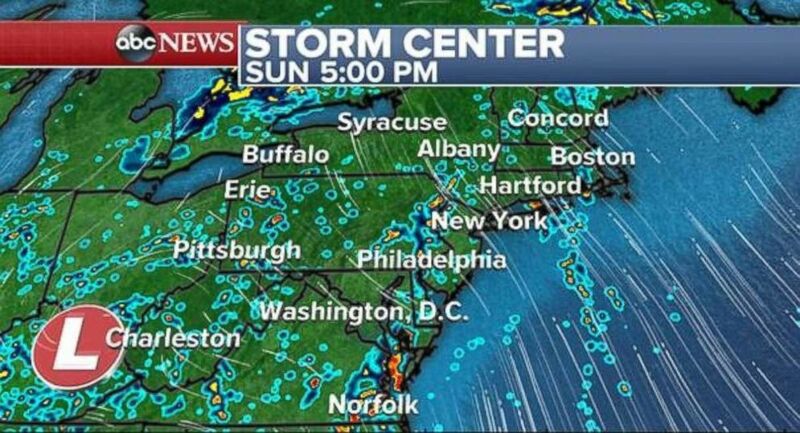 Scattered showers will cover much of the eastern U.S. on Sunday. The weather pattern becomes somewhat stalled over the next few days, and as a result, moisture off the ocean will continue to flow into the mid-Atlantic and Northeast for the next several days. Scattered to numerous thunderstorms are expected across the entire region, with locally heavy downpours at times. An additional 1 to 4 inches of rain is possible in the eastern U.S. due through early Tuesday due to numerous thunderstorms. It will also feel quite muggy. Due to the persistent heavy rain, localized flash flooding will remain a concern through much of the rest of the week. 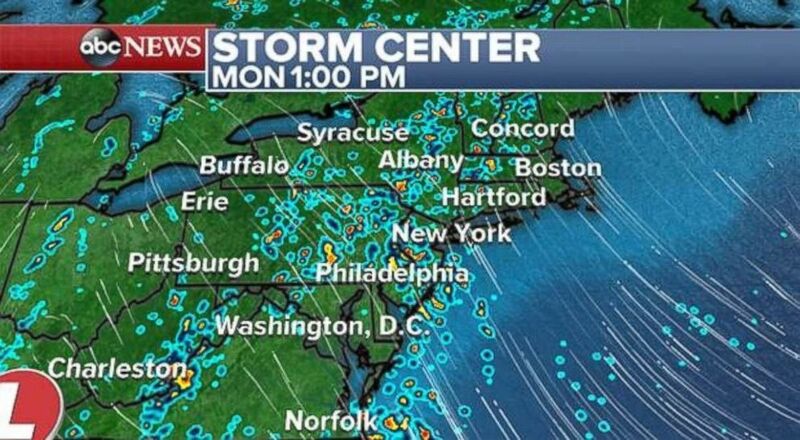 The rain will continue in the Northeast on Monday afternoon. Heavy rainfall totals will stretch from North Carolina all the way into New England. Meanwhile, in the South the next round of severe weather is possible. A slight risk for severe weather exists across much of northern Florida, southern Georgia and southern Alabama today. Damaging winds, hail, and tornadoes are possible. 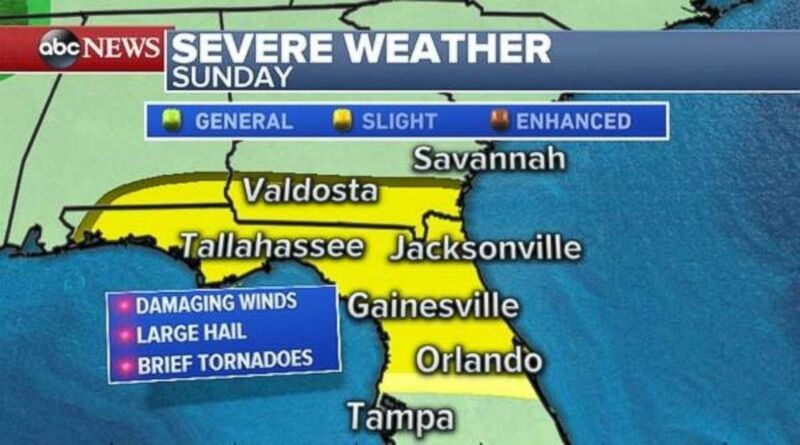 Severe weather is possible throughout northern Florida and the Panhandle on Sunday. 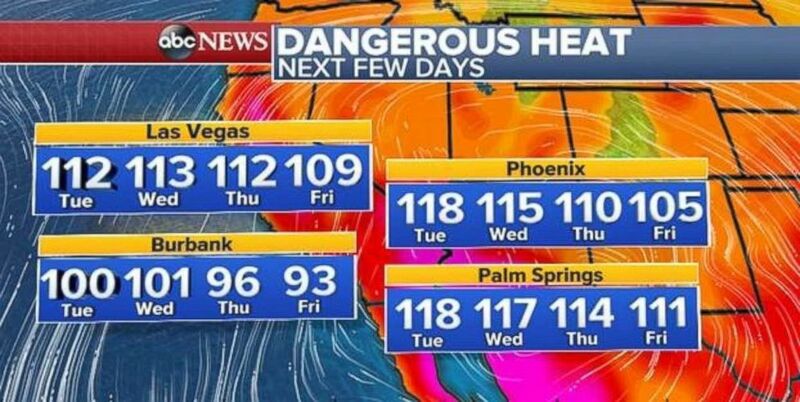 Heat is gripping the South, while a dangerous heat wave is building across the West this week. Heat alerts now stretch from the Florida Panhandle to Oregon. Dallas reached 109 degrees on Saturday, the hottest recorded temperature since Aug. 3, 2011. 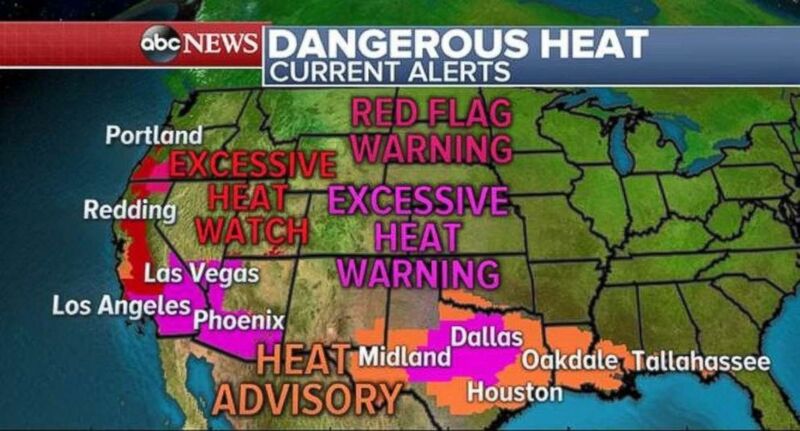 Alerts are in place for dangerous heat throughout the South and West. Excessive heat is expected for much of the upcoming week across the West. High temperatures in southeast California, parts of Arizona and parts of Nevada will range from 110 to 120 degrees during parts of the week. Across Southern California, many areas will be in the 90s to almost 100 degrees. Triple-digit temperatures will move in for the work week with 100- to 105-degree readings expected from Redding, California, to Sacramento. Temperatures locally will be over 105 degrees in this region. Temperatures will cool slightly later in the week, but that doesn’t mean it won’t be very hot. Although a bit of relief should arrive later in the week for both the western and southern U.S., the heat is sticking around for much of the upcoming week across both regions. 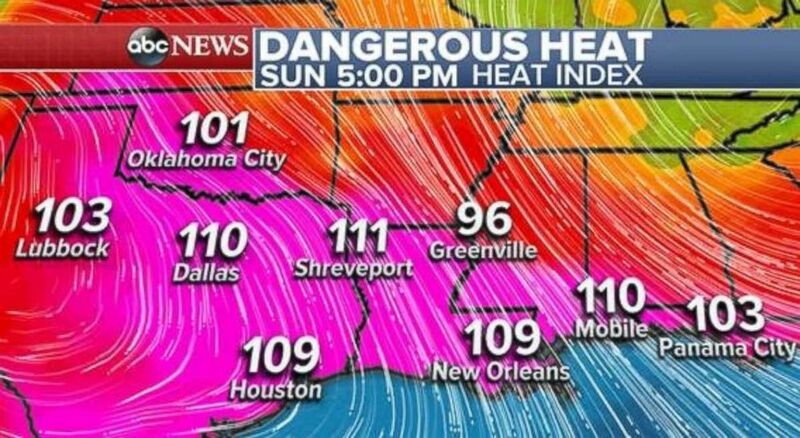 Temperatures will be over 100 degrees in much of Louisiana and Texas.